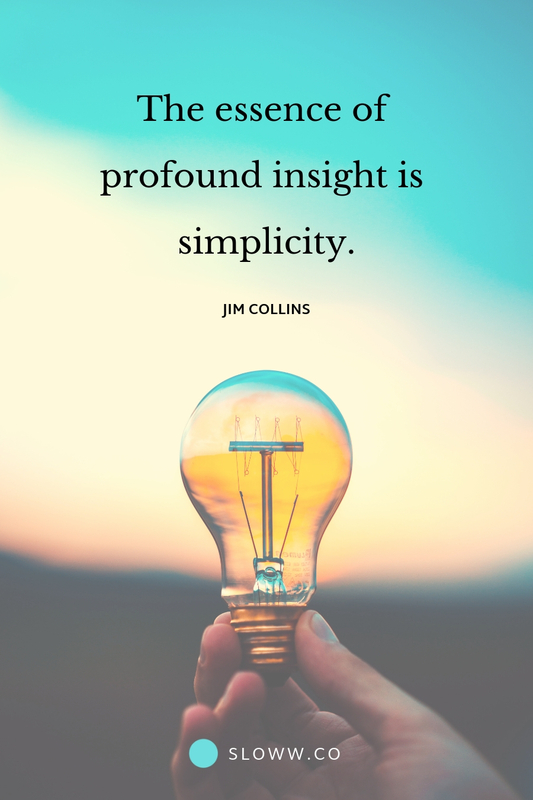 This is a companion post to the previous post: Create your Life Purpose with the Flywheel Effect by Jim Collins (note: you can also get a quick intro and video about Collins in that post). Are these two concepts really as similar as they appear? What is the Hedgehog Concept by Jim Collins? The Hedgehog Concept was originally developed by Jim Collins in his book Good to Great in relation to business. However, Collins realized that the concept can be adapted from business to people with one small tweak to the second circle. The circle changes from ‘best in the world’ to ‘what you are encoded for,’ ‘what you are made for,’ ‘what you are constructed for,’ ‘what you were put here for.’ Now, this is very different from what you might be good at. This is a fantastic video of Jim Collins sharing the concept for people. He guesses maybe only 3-5% of everyone on Earth has figured out their hedgehog. Could you imagine a world where 20% find and create it? The magic is living in the middle of the Hedgehog Concept. What is it like living within the alignment of all three circles? When all the pieces come together, not only does your work move toward greatness, but so does your life. For, in the end, it is impossible to have a great life unless it is a meaningful life. And it is very difficult to have a meaningful life without meaningful work. Perhaps, then, you might gain that rare tranquility that comes from knowing that you’ve had a hand in creating something of intrinsic excellence that makes a contribution. Indeed, you might even gain that deepest of all satisfactions: knowing that your short time here on this earth has been well spent, and that it mattered. 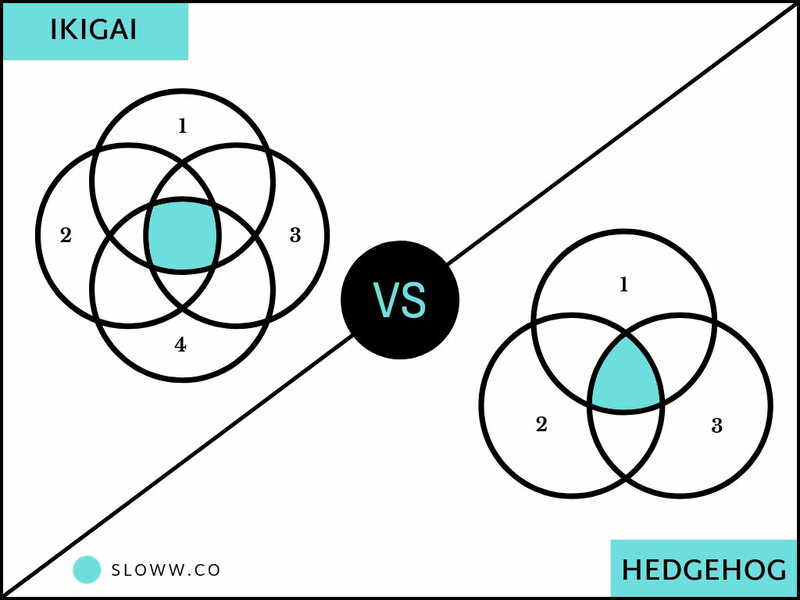 Life Purpose Showdown: Ikigai vs the Hedgehog Concept—The Same or Different? 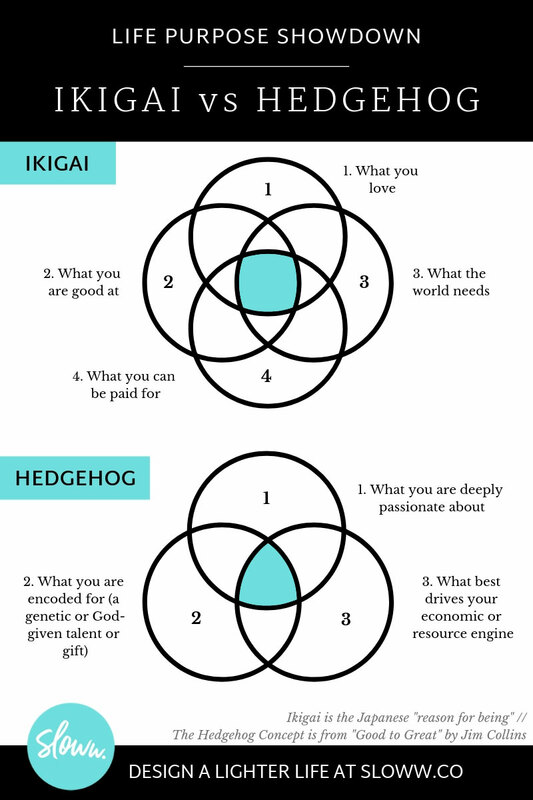 Circle 4 (Ikigai): The most obvious difference is that the Hedgehog Concept only has three circles while ikigai has four circles. However, after hearing Jim Collins explain his concept, I believe he has this circle (“what the world needs”) baked into his concept as a mandatory and therefore doesn’t explicitly say it. But, just because it’s a no-brainer for him doesn’t mean it is common sense to the rest of us, so I like the fact that the ikigai model specifically states it. Circle 2: Jim Collins makes it very clear in the Hedgehog Concept (for people) that what you are good at is not the same as what you are encoded to do. I very much agree with him based on my own personal experiences in life. I believe “what you are encoded for” is another form of “know thyself.” It really requires you to take a deep, honest look inside yourself. Transformations from good to great come about by a series of good decisions made consistently with a Hedgehog Concept, supremely well executed, accumulating one upon another, over a long period of time. I’m not a big believer in thinking of traditional careers, I’m a big believer in thinking of finding your Hedgehog, and then really building flywheel momentum with that over time. He (Maslow) defined self-actualization as discovering what you are meant to do and committing to the ardor of pursuing it with excellence. The purpose of free society, I would suggest, is to systematically increase the percentage of people who do exactly that.